A 28-year-old former Army staff sergeant suddenly stiffened and then relaxed with a smile, as the wheels of General Eisenhower's Super Constellation touched the Tampa International Airport runway today. For a moment, Everett Agee, of 220 A. Blvd., forgot he was a civilian and reacted as he would have seven years ago, when he was a member of the General's personal honor guard at his headquarters in Frankfurt, Germany. Watching silently as the huge skyliner taxied toward the cheering crowd the local car salesman wasn't certain whether "Ike" would remember him or not. But he hope heir association was not forgotten. 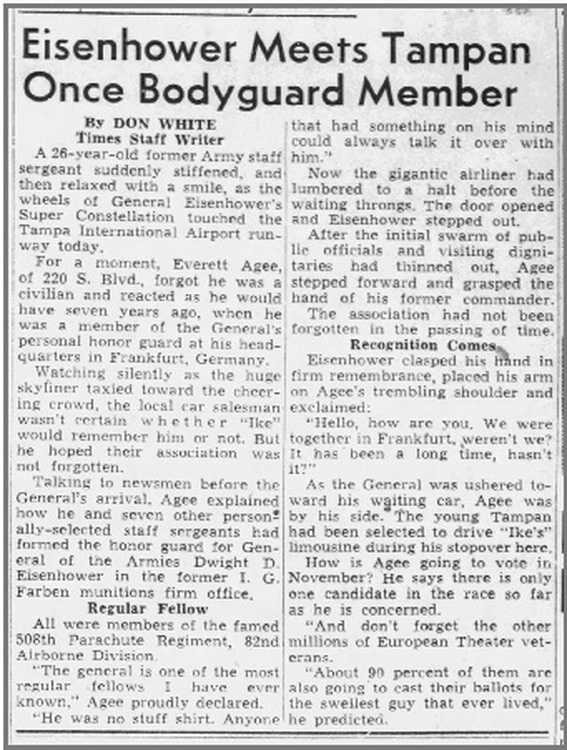 Talking to newsmen before the general's arrival, Agee explained how he and other personally selected staff sergeants had formed the honor guard for General of the Armies, Dwight D. Eisenhower at the former I. G Farben munitions firm office. Regiment, 82d Airborne Division. "The general is one of the most regular fellows I have ever known," Agee proudly declared. "He was no stuff shirt. Anyone that had something on his mind could always talk it over with him." Now the gigantic airliner had lumbered to a halt before the waiting throng. The door opened and Eisenhower stepped out. After he initial swarm of public officials and visiting dignitaries had thinned out, Agee stepped forward and grasped the hand of his former commander. The association had not been forgotten. "Hello, how are you. we were together in Frankfurt, weren't we? It has been a long time, hasn't it?" As the general was ushered toward his waiting car, Agee was by his side. the young Tampan had been selected to drive "Ike's" limousine during his stopover here. How is Agee going to vote in November? He says there is only one candidate in the race as far as he is concerned. "And don't forget the other millions of European theatre veterans." Grave marker for Everett Agee, Jr. in the Valley Center Cemetery, Valley Center, San Diego County, California. Everett enlisted in the Army on 21 August 1941 at Fort Thomas, Newport, KY. Following the completion of jump school he was assigned to the 509th PIR. His service record is unavailable during that period but in February 1945 he was transferred to the 508th probably arriving at Camp Sissonne, France where the regiment was bivouacked after the Ardennes campaign. SSgt Agee later served in Company E, 259th Infantry. His military awards include the Bronze Star Medal and the Purple Heart.